I try to actually use that thinking as much as I can. There are any number of things that come up in life that do in fact make me scared. Going out on a first date, showing up for a job interview, etc. In fact, it really stifled my life experiences prior to college because I was often too scared to try something new or take a chance that wasn't a guaranteed success. Sometime in my early 20s, though, I realized how limiting that was and decided it was high time that I take a cue from so many of the comic book heroes I had known over the years and give Fear the metaphorical finger. Of course, you can't really consciously never be afraid. That's really more of an instinctive reaction. But you can choose to push that fear aside. There's a quote floating around somewhere that I don't feel like looking up that says something to the effect of: Bravery is not having an absence of fear, bravery is being afraid and forging ahead despite your fear. It's on my mind because I've seen a couple instances lately where people in comicdom were holding back on pursuing something because of fear. In one case, it's a gent who wants to open his own comic shop. In another, it's someone who wants to create their own comic. I don't know these guys personally -- I've just heard about them through others -- so I can't speak to their ability, but if it's a dream they believe in, they should absolutely pursue it. I'm not saying to charge in without a plan or without doing any research or prep work. I'm just saying that fear should NOT be a factor in slowing you down, much less stopping you. Once I realized, for example, that I wasn't writing my book out of some nebulous fear of failure, and my excuses were really nothing more than excuses, then I couldn't justify NOT diving into it. After all, if I let fear stop me before I even start, then I'm never going to accomplish that as a goal. Fear is useful in that it does give us a moment of pause to evaluate a situation. "Maybe leaping off this ledge isn't such a hot idea." It can, and I'm sure frequently does, save lives. But if the consequences of failing at whatever you're evaluating are largely emotional (shame, disappointment, rejection, etc.) then fear isn't doing you any good. If you don't do anything, you're still going to be caught up in a negative emotion (fear) so you may as well plow forward where the outcome at least has the potential to be positive. Personally, I think this is an absolutely lousy time to open a comic shop, and it's not a business I would want to run even in the best of times. But that's not to say that it can't be done. There are certainly shop owners out there being profitable, so if you've got the love for it (and a decent business plan), go for it! Personally, I can't draw well enough or fast enough to create my own comic on a regular basis. Plus, I have a long history of doing creative stuff that doesn't draw even moderate crowds/attention. So it doesn't make sense for me to try to create my own comic. But if you DO have the talent and think what you've got to say would interest a good-sized audience, then more power to you! 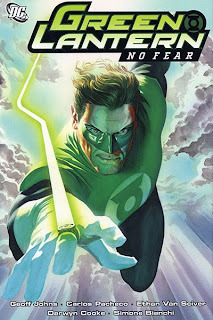 All I'm saying here, though, is to take a tip from Green Lantern and don't let a fear of failure get in your way. And if Doctor Octopus beats you up his first time out, listen to the Sean's--I mean, the Human Torch's--motivational words, and then go tie those metal arms in a big knot! For those of you playing along at home, Matt's referring to the story from Amazing Spider-Man #3. Well, you are Comics' Number One Fan, as well as the creator of the Four Freedoms Plaza web site. I figured you would be there with a net (of some sort or other!) if I slipped. Heh! I'm reminded of our classic Fantastic Four villain, Psycho-Man, and his use of the emotions of Fear, Hate, and Doubt as weapons. 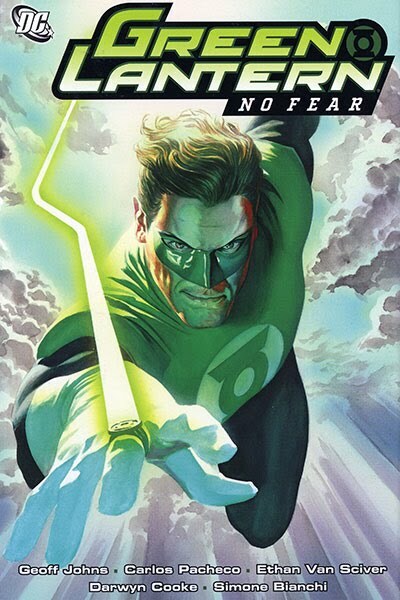 Now there would be someone interesting for the Green Lantern to battle! Nice insights, Kleefeld. But then, there's always something of value to be found in truly good comic books. Remember the words of Hiro Nakamura upon entering a comic shop: "This is the source of all knowledge!"